Any professional matchmaker would advise you to avoid a person, who is not culturally compatible. Culture here, does not necessarily mean the geographical area, but includes different viewpoint about life, a variation in thought process and mindsets and a difference in attitude. Such incompatibility is sure to cause discontent if put together. A person who lives in the world of vanity should be avoided. You do not want to marry a person who is engrossed in front of the mirror, and is not capable of holding a single quality conversation with you, as he/she does not have any time from fussing about their looks or themselves in general. Career is an important part of everyone's life, however, one who makes it the "only part" part of his life, is definitely not going to do well after marriage. People, who are obsessed with their career and work, will never make any time for their partners, which renders them incapable of accepting a spouse. A person, who is interested in you only because of the way you look on the outside, should always be avoided. These kinds of people are fixated on physical appearances only and do not care about any factor in a person.They are always looking for beautiful faces and move from one to another, until they find one. 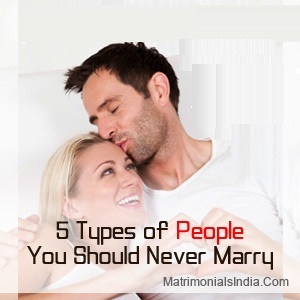 If you happen to meet a person via matrimonial services, and find out that he/she has lied about their biography, no matter how minimal it may be, it is always a good idea to avoid such people. If they cannot be truthful about basic information pertaining to themselves, who knows what skeletons are hidden in their closets.The information mentioned above should always be kept in mind while choosing the right person, as ultimately it is your choice that would spell out happiness or sorrow at the end.